When I was a small child in the early stages of primary school, we learned about jobs – a slightly tricky concept for a child who has very little understanding of money and absolutely no grasp of what an economy is. But I knew that I loved stories and books, and I loved making up little stories of my own. So when I learned that there were people who wrote the books I loved to read, and that writing books was a type of job, I was overjoyed. While most of my classmates were fighting over being vets and tractor drivers, I came home and proudly announced to my mum that I wanted to be an author. 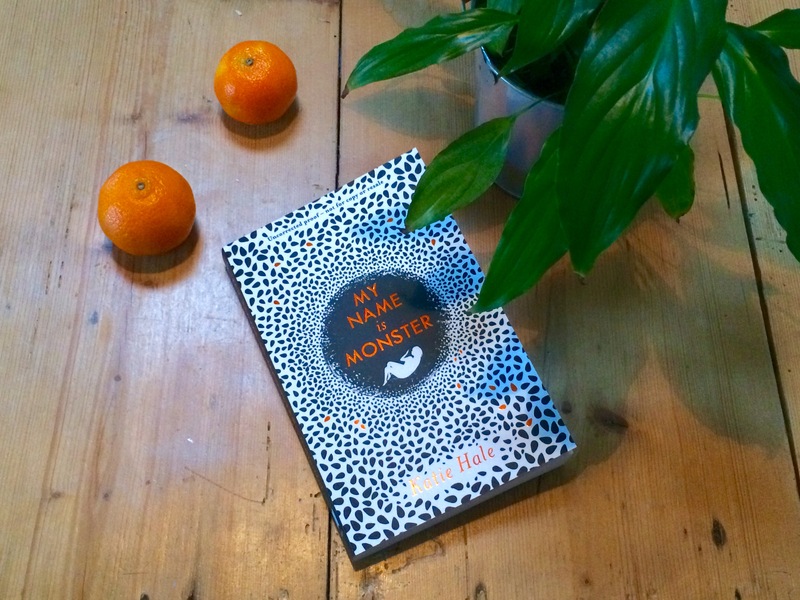 In true down-to-earth motherly fashion, my mum assured me how proud she was that I’d chosen a career (at the tender age of probably about five), but that if I wanted to be an author, I’d need a ‘proper job’ as well. Writing books, she told me, was something most people did on the side. I’d need to find a way to pay the bills. For a couple of weeks, I thought about this. At that time I’m not sure I had any idea that some jobs paid more than others, so it was a lot to get my head around. As adults, we know that some jobs pay more than others. We also know that some jobs pay enough to live off, whereas others do not. And let’s be honest, writing has always had a pretty bad reputation in terms of salary. You’re either J K Rowling, or you’re stuck in a garret somewhere with no heating and only half a heel of mouldy bread. As far as many people believe, there is no in between. Not true, of course. There are plenty of authors who make a reasonable living from their craft, without become yacht-owning multi-millionaires. Just as there are plenty of authors who make an ok amount of money, but still need to keep another job to make up the rest. 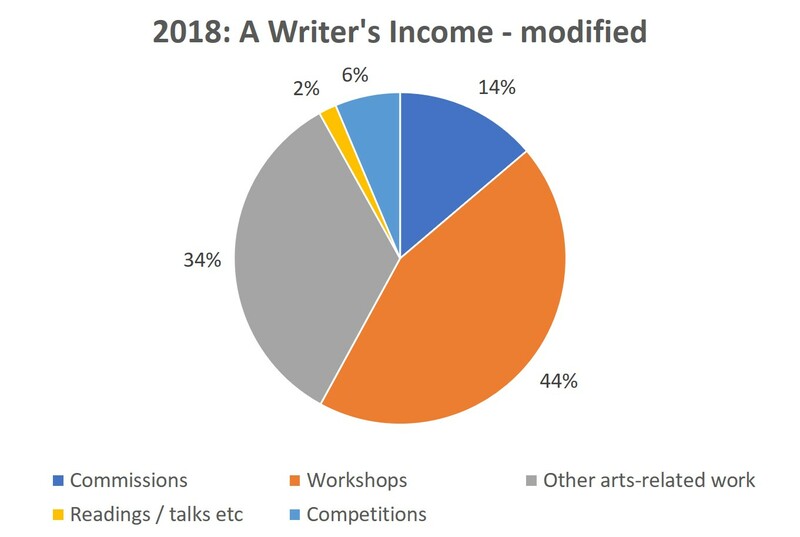 As with most careers, there’s a huge range of income levels, and a lot of that depends on the writer: what they write, their level of output, and what else they do alongside the actual writing to keep the wolf from the door. In this post, I’m going to talk a bit about different ways to make a living as a writer. I’m then going to unpack this, and (with the help of some pie charts and a couple of line graphs) talk about what this looks like in practice in relation to my own income as a writer. There are many different ways that a writer can make a living. Some of these depend on what you write (for example, poetry can look very different to commercial fiction), and some just on the preferences of the individual writer. Some means of earning an income will be directly related to the writing, and others less so. It’s all about what works for the individual writer. As I write poetry and fiction, that’s what this post is focusing on. If you write scripts of any kind, or creative non-fiction, your outlets, and therefore your potential income streams, might be slightly different – although many of the following apply across genres. So how do you earn a living as a writer? This is perhaps the most obvious way for a writer to earn money – though many writers probably don’t earn as much from this as you’d think. 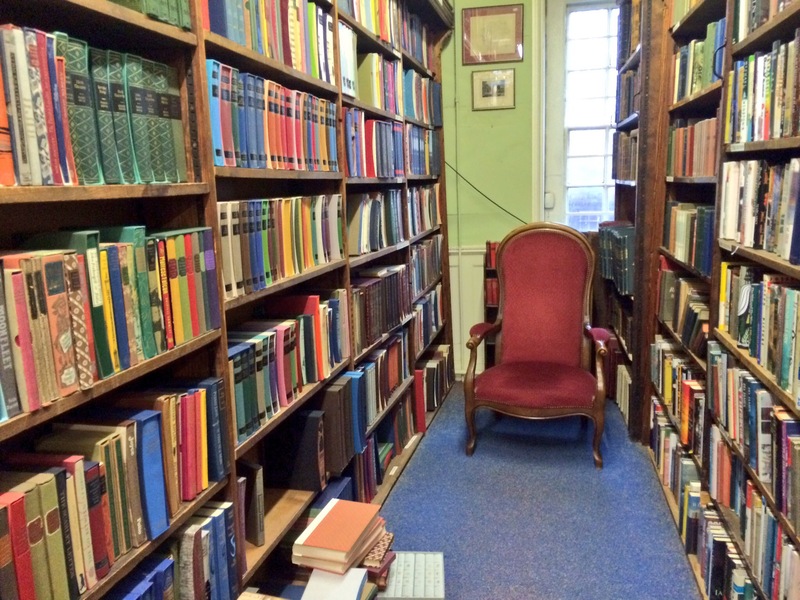 It’s not uncommon for debut authors to get an advance of £5k, 15% of which goes to the agent. Hardly enough to live on, especially if you’re only publishing a book every few years. Other ways your book can earn you money are through royalties from book sales (once they exceed what you’ve already been paid in your advance), and through the selling of additional rights, such as film rights or foreign rights. This effort to sell further rights to your book will be done either by the agent or by the publisher, depending on the terms of your contract. Note: the above applies to fiction / non-fiction. If you’re a poet, you might earn enough for a couple of bottles of wine from selling your book, but I wouldn’t put the deposit on that mansion just yet. Usually once the book is published, an author will do events connected with that book. These could be anything from a reading of a section of the book, to a Q&A about their publication process, to a talk or panel discussion about some theme connected with the work. Often, they’re a combination of aspects of the above. These opportunities aren’t always paid, but they should be. (See the Society of Authors’ page about where they stand on paying writers for appearances at festivals.) Thankfully, more and more, festivals and organisers seem to be wising up to the fact that this is work, just like any other job, and that authors need paying accordingly. As you might expect, writers who publish once every few years tend to get more of these talks & readings in the years that they have books published. And, like everything else, certain writers’ work goes in and out of fashion, as do certain ideas. Which means that, while giving talks & readings can be a good way to supplement an income, it isn’t a steady constant. Many writers pass on their craft to other writers. This can involve running writing workshops in schools, or for adults – either through festivals, residential writing courses, or self-organised. Many writers also offer mentoring to other aspiring writers (either paid for individually by the mentee, or funded through some sort of arts funding), and / or teach at university level. However, like any type of teaching, each of these has its own set of skills, which are themselves distinct from the skills you need simply to be a good writer. There are plenty of writers who run workshops because it’s the ‘done thing’, who realise quite quickly that they don’t enjoy it. My advice: if you don’t enjoy it, don’t do it. Your workshop participants will pick up on your lack of enthusiasm, and you won’t be doing yourself (or your participants) any favours. On the flip side, if you enjoy running workshops, then go for it! There’s huge benefit to anyone in being taught by a skilled writer who’s passionate about passing on the skills of their trade. I mentioned the F-word. Sorry. But there are a number of different ways to access funding as a writer. One of these is to do a fully funded PhD – which essentially means you get paid to write for around 3 years (which is normally the length of time a funding body will fund you for a doctorate). These aren’t always easy to come by, and you have to be certain you want to dedicate 3 years of your life to doing a PhD, but if you can get one, it’s a great way to make sure the bills are paid and still have plenty of time to focus on writing / studying some aspect of your writing. You can also find funding to write from other sources, if you don’t fancy doing a PhD. These include things like the Arts Council’s Developing Your Creative Practice grant, which gives artists up to £10k to focus on developing some aspect of their creative practice, and so far seems to have a roughly 1 in 10 acceptance rate, which isn’t bad. The Society of Authors also gives contingency grants and grants for works in progress. If you want to run another writing-related project, which isn’t just your own writing, then there are funding bodies you can apply to for that as well, including places such as Arts Council England (or Creative Scotland / Arts Council of Wales / Arts Council of Northern Ireland, depending on where you’re based), the Heritage Lottery Fund, the Fenton Arts Trust, and the Jerwood Foundation, to name just a few. Most of these require your project to work with other people, and have some sort of outreach / public impact. Some can be applied for as an individual, and some require you to work with an organisation. A commission is when somebody (an organisation or another person) pays you to write something for them. This could be anything, and commissions vary in terms of how prescriptive they are. For instance, some give you quite a bit of free reign to interpret the creative brief, whereas others have a very set idea of what they want you to produce. As with commissions, writer in residence positions can be extremely varied in what they offer. Because this is a post about earning income, I’m going to leave aside talking about the sort of residency where the writer pays to attend, and focus on the more generous sort – some of which will pay the writer a fee, some will pay transport & a small stipend, and some will just provide the free accommodation and maybe a few meals if you’re lucky. It all depends on the individual residency. Even the residencies that don’t directly pay a fee can be a huge financial benefit though – particularly in winter, when the heating bill can be enormous, and you’re effectively living without having to pay bills. In the same way, different residencies will require different things from the writer. Some will require very little, and will instead allow the writer to write at their own leisure for the duration (which can be anywhere from a week to several months to even a year). Most require some sort of reading of work-in-progress at the very least, and some require engagement with the local community, either through workshops or school visits or talks. These sorts of residencies can be quite competitive, particularly for the more lucrative / prestigious ones, but the time to write can be invaluable. Equally competitive (if not more so) are writing prizes. These can be prizes for anything from a single poem, to a collection of poetry, to a short story, to a full novel. As well as the famous ones like the Man Booker Prize or the Costa Prizes, there are the prizes that unpublished writers can enter. Many of these charge a submission fee, though, so some careful calculations need to be made about how many of these to enter (and which ones) if you’re going to make money rather than lose it. And even then, it definitely isn’t a reliable source of income. I’ve already sort of mentioned this when I was talking about funding a few points up, but there’s plenty of other work a writer can that’s related to their creative practice, but isn’t just writing. Many writers work as editors, either for publishing presses or for independent magazines. Some also hold other jobs within publishing, or work as reviewers. And you know those prizes I was talking about? Most of those are judged by writers, who are (mostly) paid to do so. Or, if a writer prefers to keep the artistic section of their brain separate from their other job, then there are plenty of other ways to earn money. I know writers who earn their income working in call centres, clearing tables and pulling pints. As long as it allows them to write, and to pay the big red bills when they come through the letterbox. Ok – so what does all of this look like in real life? The term for this type of living seems to be ‘portfolio career’ – which sounds much more impressive than saying I do ‘bits and bobs’. More accurate, too, because I often find that the various aspects of my career inform one another. For instance, experiences in the workshops sometimes feed into my own writing, and connections made through my arts administration roles have led to commission opportunities and appearances at festivals. So how did I earn my income last year? I’ve broken my income down into sections: earnings from commissions; earnings from running workshops (for young people and for adults); income from competition wins; earnings from readings / talks etc; money from my advance on my novel; income from other arts-related work (mostly, but not limited to, arts administration roles). 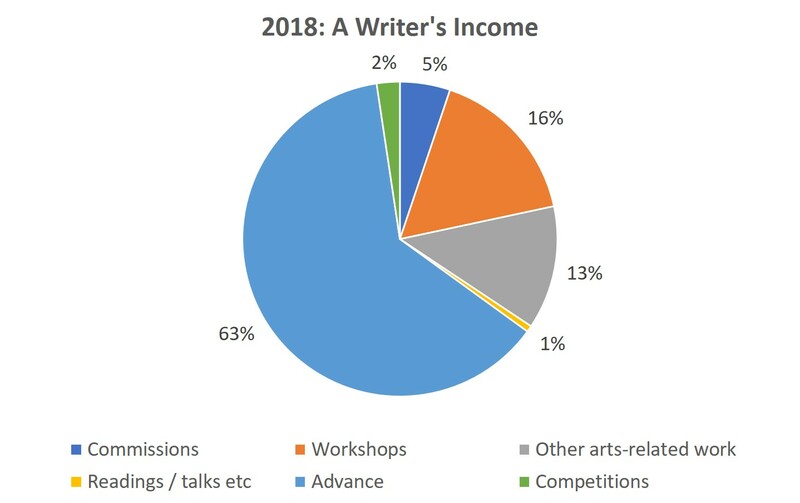 As becomes clear very quickly from looking at this pie chart, over half of my income last year came from the advance from my novel. That makes sense. Depending on your publisher, an advance is usually paid in 3 or 4 installments. Mine is paid in 3, and because of various things to do with timings, I just so happened to get the first 2 installments in consecutive months last year. But, as I mentioned earlier, unless you’re publishing a book a year, you’re not going to get regular advance payments, which makes this year a slightly special one – and means that 2018’s income is highly skewed because of it. What we’re left with is a much more honest illustration of this type of portfolio career: just under half coming from workshops; around a third from other arts-related work; a reasonable chunk from commissions; and a smattering from competitions and readings. CAVEAT: These proportions are specific not only to my career, but to this very particular year of my career. For example, the 2% for readings / talks is because I only appeared at one festival in 2018. This isn’t particularly surprising, when you think that the only book I had out was my pamphlet, which had come out the previous year (and I’d already done quite a number of events for it in 2017. If I do another pie chart at the end of 2019, when I have a poetry chapbook and a novel coming out, it’ll probably have different proportions here. So how does this variation play out throughout the year? If a writer’s earnings can vary so much from one year to the next, what do they look like from month to month? Again, these levels are skewed because of the novel advance. 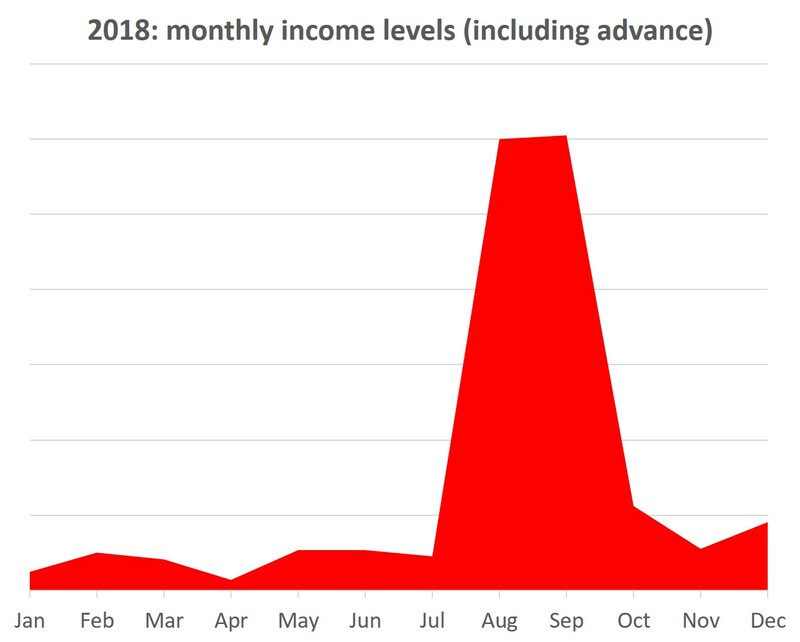 If you compare this graph to the first pie chart, we can see that I received 63% of my 2018 income in two consecutive months. But, as I said, this is kind of an anomaly – at least for me. Even without the anomalous skew of the advance affecting the shape of the graph, April was a tough month. If every month was an April, then I’d definitely have had my electricity cut off by now. But then, April in 2018 contained Easter, along with all its attendant bank holidays, not to mention the school holidays. So suddenly this dip starts to make a lot of sense. 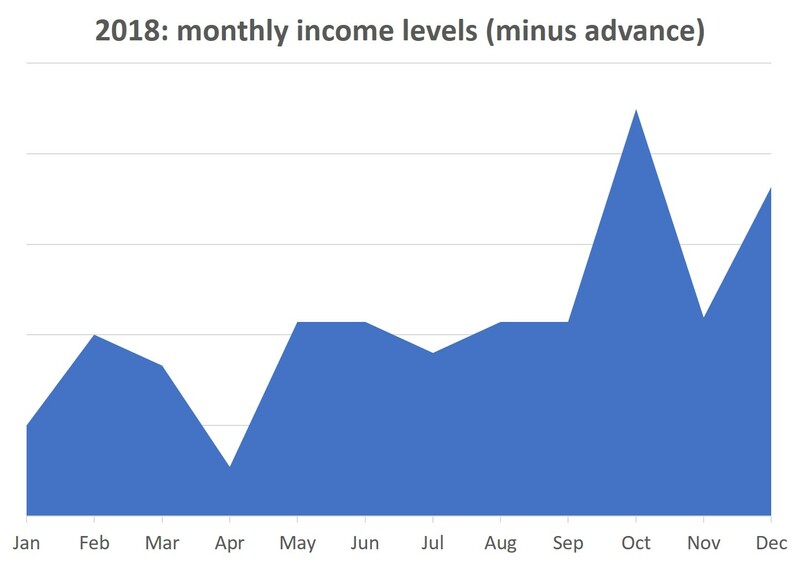 But if we look at the overall picture of the graph, rather than just month-by-month, my income has (generally speaking) improved as the year has progressed. Certainly I earned more in the second part of the year than I did in the first. I’m attributing this to the general progression that my career has undergone this year, rather than to some sort of shift in availability of work in the earlier to the later months. But whatever the reason, it certainly shows that a writer’s income is far from reliable. It’s sporadic to say the least, and generally requires not only a willingness to juggle a portfolio of different income streams, but an ability to save for the leaner times as well.